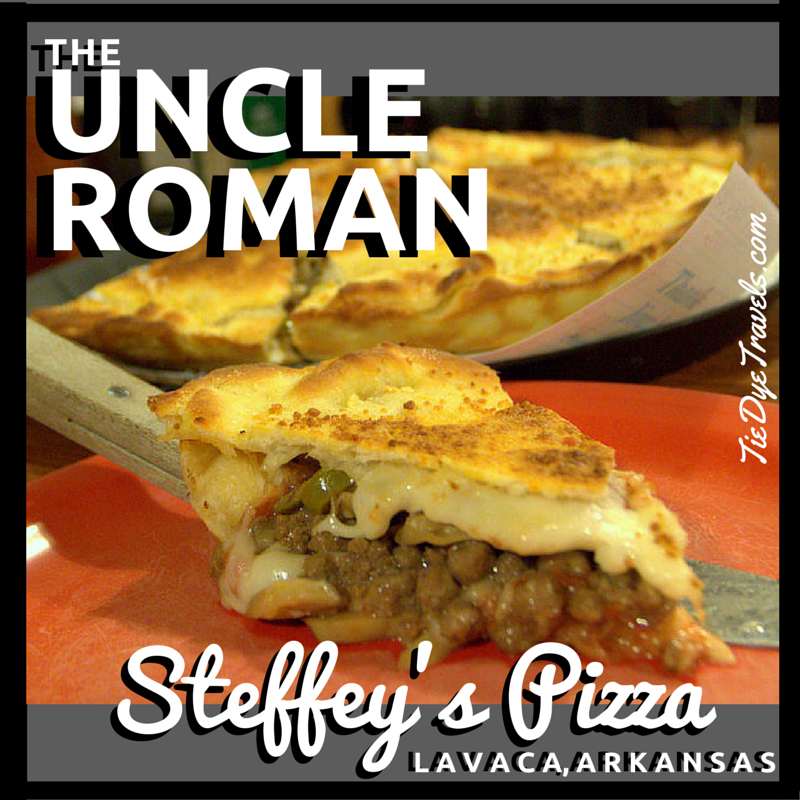 Say, Have You Tried The Uncle Roman at Steffey's Pizza? 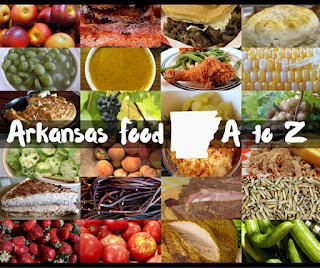 Not to retread followed paths again, but I have to come back to my favorite pizza in Arkansas. 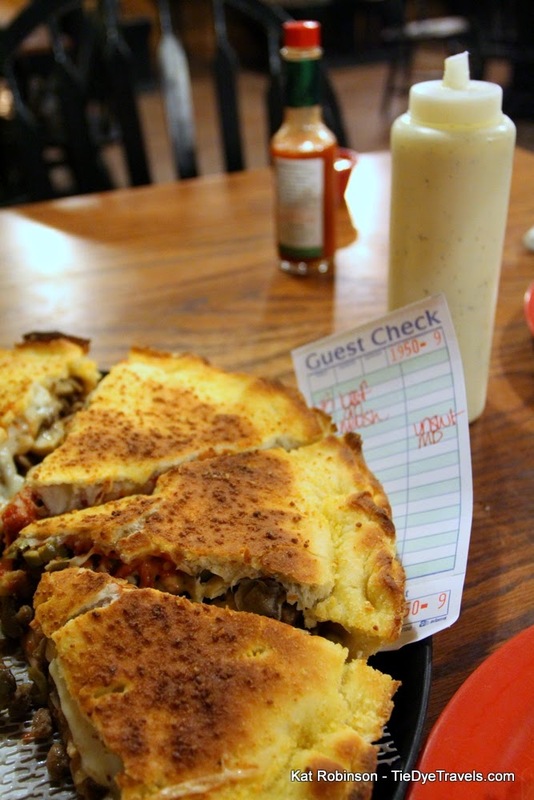 More beloved to me than ZaZa's Forager, Damgoode's Artie or even Rod's Lil Heifer, comes the Uncle Roman at Steffey's Pizza, a double-crusted stuffed pie baked in a 12” cast iron skillet. And though I've written about it before, by gum I'm going to write about it again, because it's been nearly four years, and because you should know the history of the place. 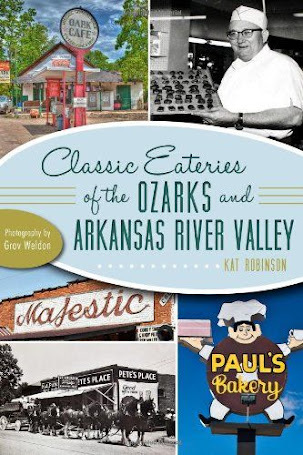 Yes, I already shared that history in my second book, Classic Eateries of the Ozarks and Arkansas River Valley. In case you missed it there, here 'tis again. Back in the 1950s, Glen Steffey was stationed at Fort Chaffee, where he was assigned the position of baker. 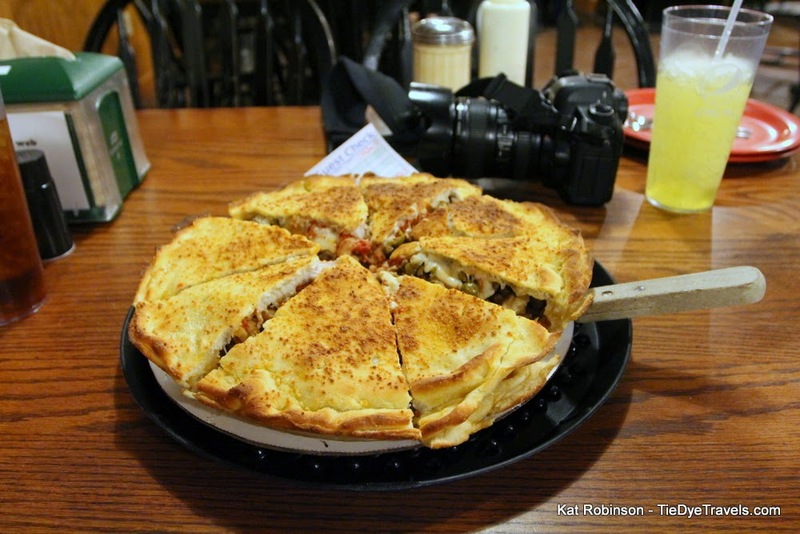 Between Fort Smith and Delmont, PA he developed his very own crust and sauce recipes, and he opened the first Steffey’s with his wife Ruth there in 1963. After a few years she decided to be a stay-at-home mom and he decided to pursue a career as a truck driver, so they shut the place down. But Glen really enjoyed making pizza, and within a few years they were making and selling pizza out of their basement a couple of nights a week. The trucking business started slowing down in the area in 1980, and Glen went to Stiegler, OK to work. He went one day over to Lavaca to visit his friend Don Ray, and something about the area convinced him he was meant to be there. 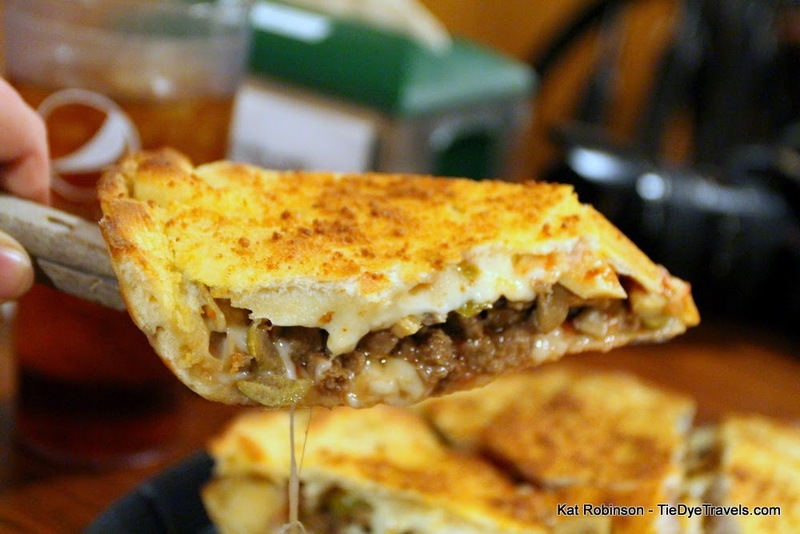 So he moved the whole family down – and in 1981 opened Steffey’s Pizza. Glen eventually taught his daughter LeAnn the recipes he’d developed, and today she operates the place with her husband Shayne and daughter Briar. 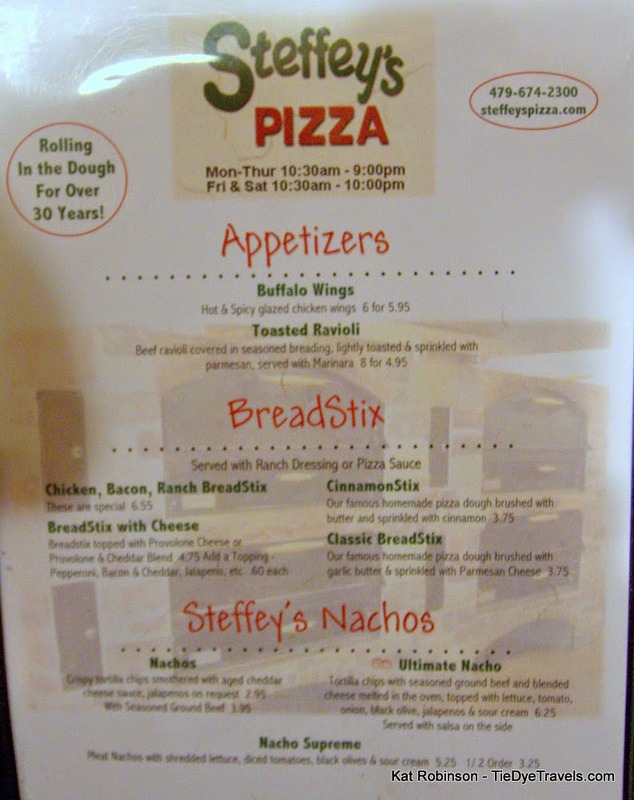 Steffey’s Pizza started out in a location west of the current store before being moved downtown where it thrived for a couple of decades. The new store opened in 2008. It’s clean and homey with four big pizza ovens exposed in the kitchen that’s right in front of you when you walk in the door. There’s a game room with a pool table, an old fashion Horwitzer jukebox (that plays for free) and arcade to the left, and a dining room featuring tables lit with lights ensconced in cheese graters to the right. 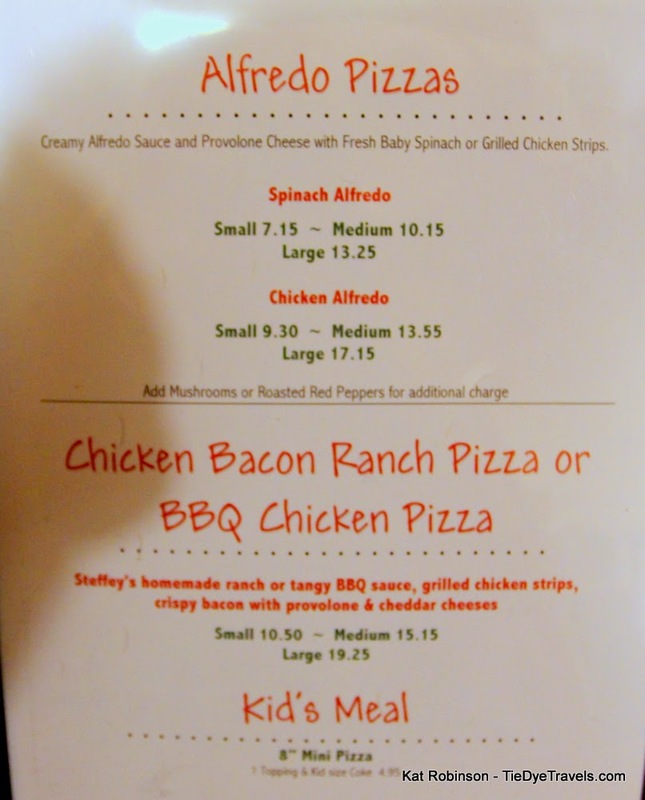 There are many pizzas available at Steffey’s with all sorts of toppings. 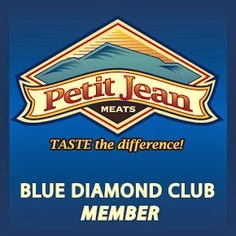 There are sandwiches, big sub sandwiches baked in the ovens. There are nachos and breadsticks and salads. 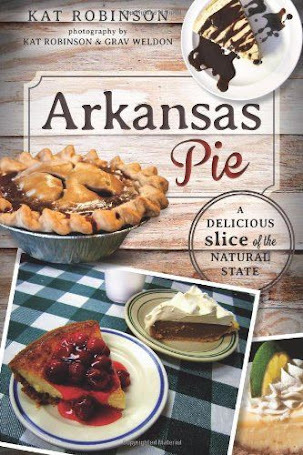 But all these pale compared to that one specially featured pie in the middle of the menu. 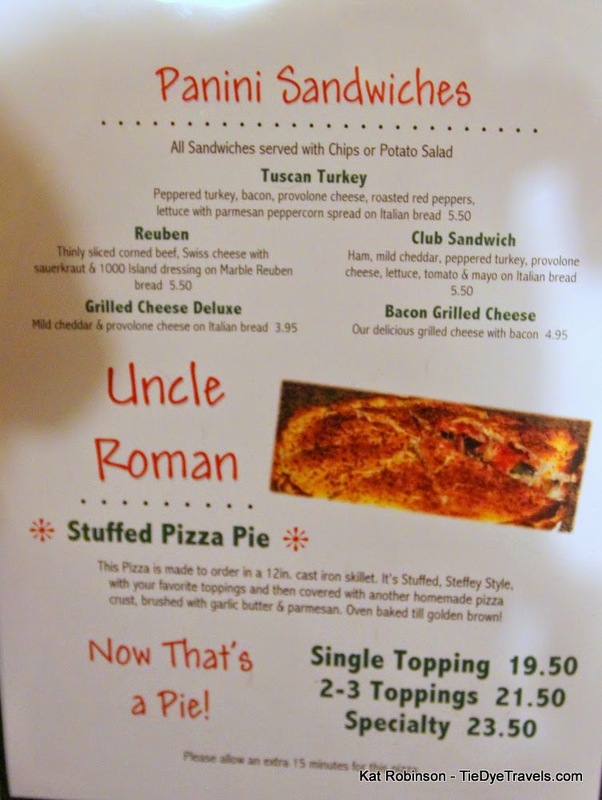 The Uncle Roman hasn't always been on the menu — it was something that was put out on the buffet early in the week on Monday through Wednesday that caught on. Because it takes an extra 15 minutes to cook, the folks who run the restaurant were afraid it wouldn't catch on. But people are understanding when they see that direction on the menu to expect a longer cook time. 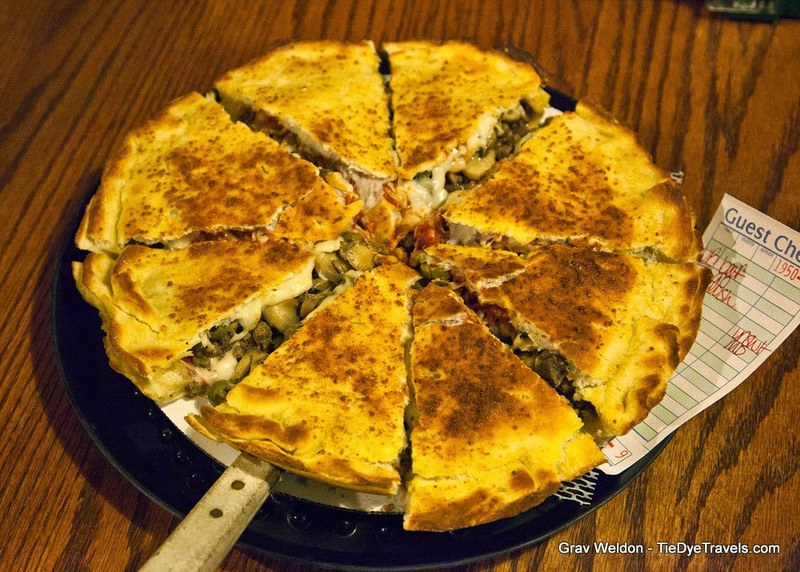 There’s just one size for the Uncle Roman, and you choose the toppings. 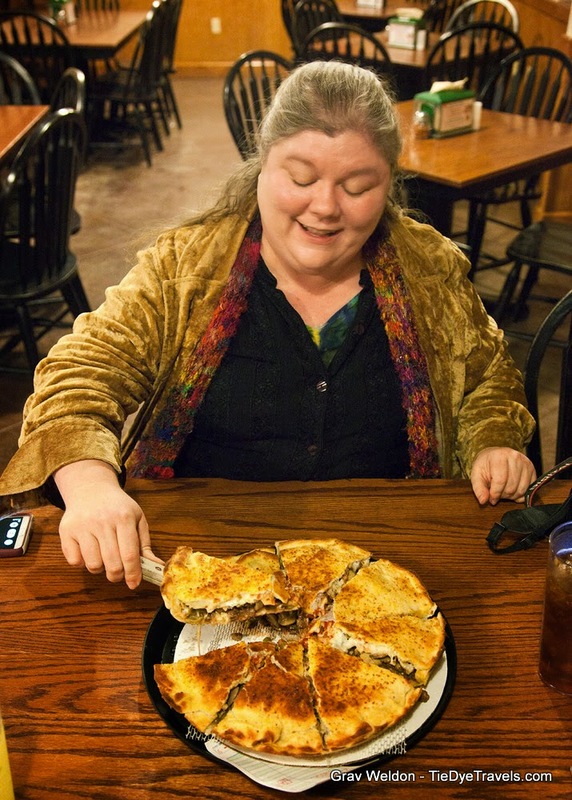 It’s cooked in a cast iron skillet between two parmesan-dusted crusts, sauce and cheese gluing the whole mess together. the left when you walk in, a giant dining room to the right. This time around, we decided to change up our Uncle Roman order, going for a filling of beef, mushrooms and green olives. It was a hit. It was such a hit that neither of us could eat more than a slice and a half. But that works -- because a visit to Steffey's always means breakfast is taken care of for the next morning. Sometimes lunch, too. dusted crust, it totally works. 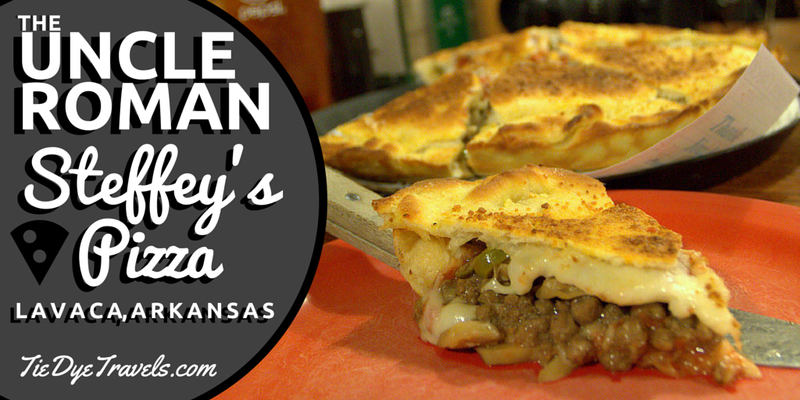 Lavaca may not be on your direct line to get from anywhere to anywhere else, but it is a great place to visit and this is a pizza you really have to try. 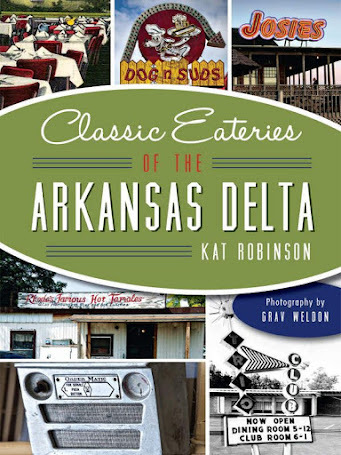 The recipe may be in the book, but the real experience is in downtown Lavaca, and you owe yourself a trip. 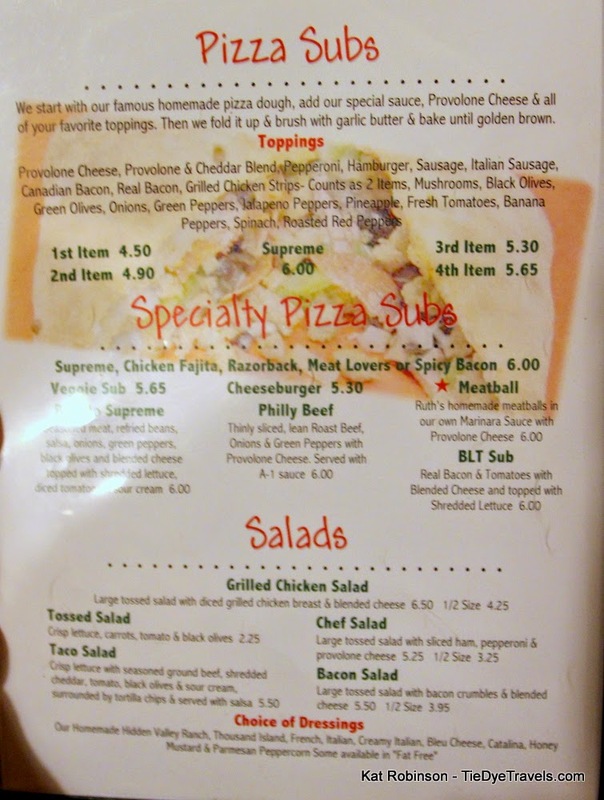 Looking at the menu and the photos, I can't tell if the Uncle Roman has cheese on the inside or just the outside? 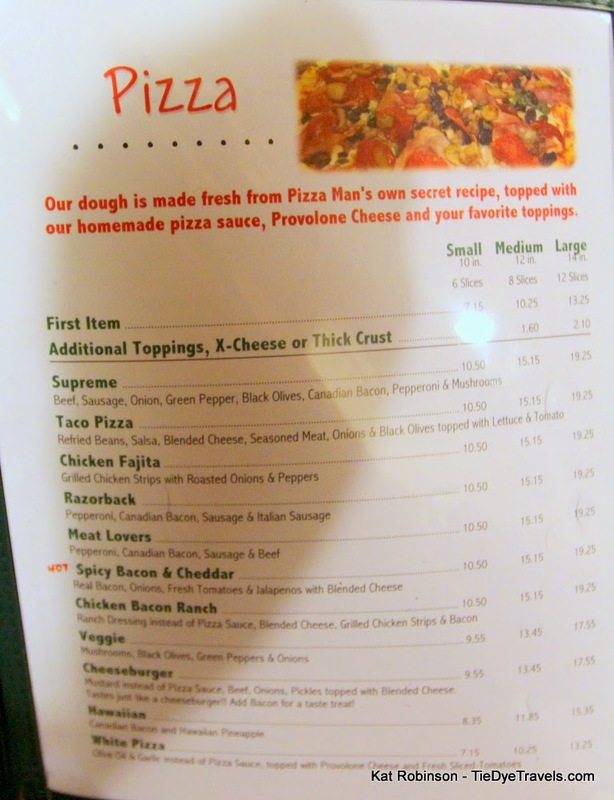 I see there is a cheese ingredient, so do I have to order it if I want cheese inside the pizza?